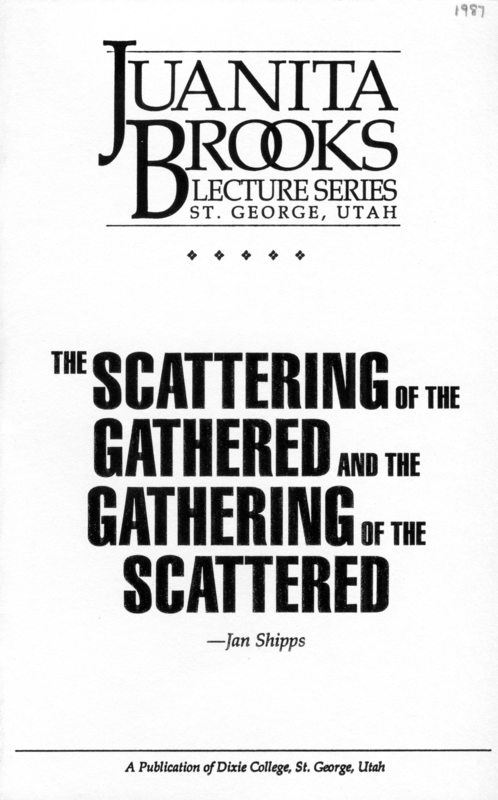 Juanita Brooks was a professor at Dixie College for many years and is a well-known author. She is recognized, by scholarly consent, to be one of Utah’s and Mormondom’s most eminent historians. Her total honesty, unwavering courage, and perceptive interpretation of fact set her fellow historians more stringent standards of scholarship to emulate. 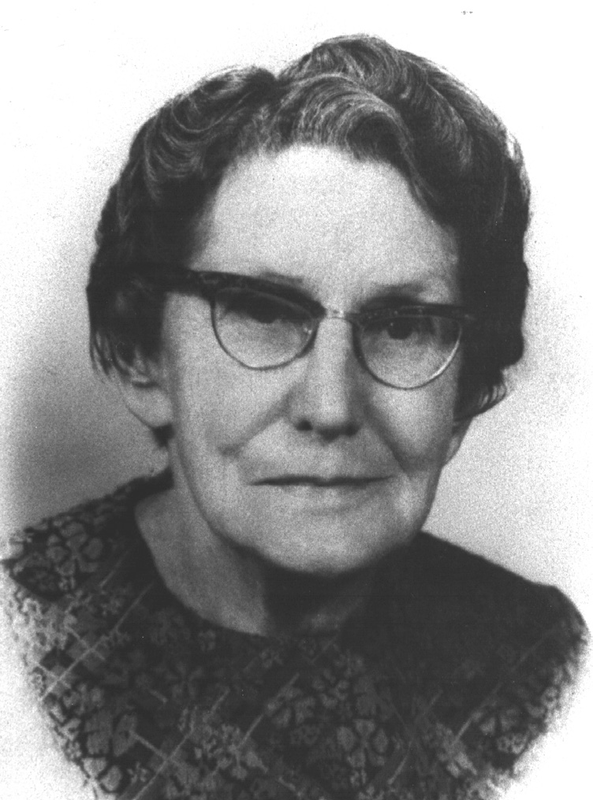 Dr. Obert C. and Grace Tanner have been lifelong friends of Mrs. Brooks and it was their wish to perpetuate her name through this series. Dixie College and the Brooks family express their thanks to Dr. and Mrs. Tanner. By revelation given in 1830 through the Mormon prophet, Joseph Smith, God called the members of the Church of Jesus Christ, newly organized in April of that year, to gather themselves together as baby chicks are gathered under a mother hen’s wing. At that time the prophet and most of the Latter-day Saints, as the members of the group called themselves, expected the imminent ushering in of the millennial kingdom. The Saints’ corporate response to the gathering revelation heightened the millennial expectations of the whole group and this, in turn, released an incredible amount of what some would call psychic energy, but what others would describe as religious or spiritual commitment. The gathering of the Saints which came about first in Kirtland, Ohio, also led to an astonishing willingness on the part of the Saints to make huge proportions of their meager resources available for building up the Kingdom. The result was that a great variety of persons from diverse backgrounds who held in concert the belief that they were God’s chosen people in these, the latter-days of the last dispensation of the fullness of times rapidly coalesced into a communion of Saints, a new community. The members of this community generally gave assent to the complex set of theological claims on which Joseph Smith’s standing as a prophet rested, so they not only shared millennial expectations, but also understandings of the sources of legitimate authority in both the civic and religious realms. The Kirtland Temple, which the Saints constructed according to specifications given through their prophet, symbolized their shared convictions. It gave them a holy place literally in the geographic center of the community and it was the setting for the extraordinary corporate baptism by the spirit that the Saints experienced during the building’s dedication. Indeed, insofar as the Mormon kingdom is regarded as synonymous with the Kingdom of God, it can be said to have commenced during the transfiguration-like happening which stood at the heart of the dedication of the Kirtland Temple. 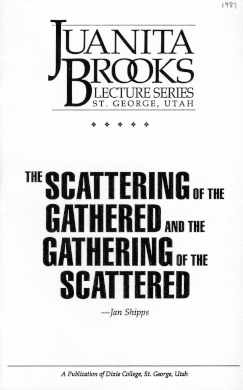 The significance of the gathering for Mormon self-understanding was not lost on non-Mormons. In Ohio, Missouri and Illinois the corporate character of Mormon life frightened those who stood on the outside. Assessing the extent to which it was politics, or religion, or economics that turned non-Mormon fright to active hostility is interesting, but extremely difficult. Yet it is easy to see that opposition from without gave the Saints something to stand over and against: Christians versus the Lions; Saints versus a Gentile world. Saints had no choice other than taking sides and as they did so their identification with Mormonism intensified. Therefore, the vicissitudes the movement suffered in Ohio, Missouri, and Illinois strengthened LDS self-understanding. During the ecclesiastical administration of Church President Joseph F. Smith (1901-1918), Senator Reed Smoot and other influential Mormons had worked hard in Washington, D.C. and in overseas embassies to reverse the U.S. immigration officials’ practice (if not policy) of disallowing the applications of Mormon converts who wished to gather to Zion.5 Unfortunately for the gathering Saints, however, the Great Basin did not lend itself to intensive population settlement when agriculture was the primary means of earning a living. LDS church authorities soon came to realize this and, therefore, even as success attended their effort to change the situation with regard to LDS immigration, the church itself changed its attitude with regard to the gathering revelation. While this policy turnabout was by no means limited to Saints outside the United States, Saints in this country continued, for the most part, to live in the traditional Mormon areas of Utah, southern Idaho, western Wyoming, eastern Nevada, northern Arizona and eastern New Mexico. There were exceptions: across the years individual Saints or single families left “the valley” for various reasons; a goodly number departed from the intermountain area because they were disenchanted with Mormonism; many of the others who left did so for economic reasons while maintaining their allegiance to the LDS Church. In perhaps a majority of these latter instances, ties to the Saints could only be maintained through the mails, entertaining traveling Mormons, or going “home to Zion” for visits. If there were organized bodies of Saints nearby, these were usually centered in the mission homes that served the LDS converts who did not gather in the west and housed the church’s then comparatively small band of missionaries.9 The main exception to this pattern before the end of the Great Depression came with the organization of a stake (an ecclesiastical unit comparable to a Roman Catholic diocese) in Oregon in 1901 and the opening up of a Mormon region in southern California during the early years of the administration of Heber J. Grant, who served as president of the church from 1918 to 1945.10 The first LDS stake established in California was established in Los Angeles in 1923. A second California stake was organized in Hollywood in 1927 and a third was organized that same year in San Francisco. Before the Second World War, nine other stakes were organized in California.11 Such units were also organized in several major urban area in the U.S.: New York, Chicago, Portland (Oregon), Seattle, and Washington, D. C. A stake had been organized in Hawaii as well. Even so, developments that led once and for all to the permanent, apparently irreversible policy that “Zion is where the people of God are” did not come until the end of World War II. And then, although the area outside the Mormon west was known as the “mission field,” the motivation for the Saints to settle throughout the nation was not religious. In fact, the scattering of the gathering came about without direction from the church. Because they remembered how hard the depression had been in the Great Basin, many service persons, returning from World War II tours of duty, sought employment outside the Mormon culture region. Professional opportunities made almost universally available through the G.I. Bill attracted Saints to “Gentile” colleges and universities and, thus, very often to work outside and away from Zion. Moreover, the natural increase that came to most American families during the post-war “baby boom” came “in spades” to these Mormon families who had settled out in “the mission field.” As a result, significant numbers of Latter-day Saints scattered all across the United States in a surprisingly short time. By 1960, only Kentucky, Tennessee and the Dakotas could not claim at least 1,000 members of the LDS Church. Of particular importance in this post World War II scattering was the spread of Mormons across the Southern United States, the Midwest, particularly Indiana and Illinois, and the Pacific Northwest. The out-migration of Saints from the traditional Mormon culture region and the difficulty of calculating the relative size of natural increase in Mormon families in this Great Basin area, as opposed to those in other parts of the nation, make it almost impossible to compare with any real precision the levels of church growth in and out of the Mormon culture region during the first two decades after the end of the war. But as the following table demonstrates, if the organization of new stakes is used as a measure, Mormonism’s changing geographical profile is easy to discern. *In addition to the 241 stakes organized in the United States during these years, 22 stakes were organized outside the nation’s boundaries. In most cases, however, these new stakes were formed from long-established missions. Because such a large proportion of church growth since 1965 has been due to convert baptisms and to the elevated Mormon birth rate (as opposed to birth rates among non-Mormons in the U. S.) and such a large proportion of the new stakes that have been organized have been outside the U. S., further comparison between numbers of Saints in the Mormon culture region and in the rest of the nation does not reveal very much about the scattering of once gathered Saints. But another post-World War II phenomenon, the rise in importance of oral history, makes it possible to describe what happened as Latter-day Saints settled all across the country. Accounts drawn from materials gathered through the James Moyle Oral History Program established by the LDS Church during the “historical administration” of Leonard J. Arrington and from an oral history project in which a more or less haphazard selection of bishops and former bishops were interviewed reveal that there was a good deal of “backing and filling” on the part of the church administration as the extent of the scattering was clarified.12 Moreover, considerable variation characterized the good-faith attempts made by general authorities to give individual attention to each situation. Nevertheless, there was a pattern of church response to the scattering that can be described programmatically. Before embarking on this description, a reminder that the LDS Church has no professional clergy is in order. The Saints have a lay priesthood organized in quorums of the Aaronic or lower priesthood order and the Melchizedek or higher priesthood order. These quorums are ranked from lowest to highest, with the deacons, teachers, and priests quorums being in the Priesthood of Aaron, while quorums of elders, seventies, and high priests are in the Priesthood of Melchizedek. Latter-day Saint males are generally ordained as deacons in the Aaronic Priesthood at the age of twelve. Ordinarily LDS males move through teachers and priests quorums in their teens and are elevated to elders quorums in the Melchizedek priesthood as they move into adult life. But if they become inactive for some reason, they are not automatically moved into the higher priesthood. Therefore they retain their Aaronic priesthood rank. Inactive young men were not Bishop Astle’s only problem however, for in his ward “out of about 150 families, more than half were what we call split families with just one member, usually the woman, belonging to the church.”13 This was not an isolated situation limited to one area of the country in the years following World War II. Many young LDS women had married non-Mormon servicemen during the war. They had likewise left the Mormon culture region to settle elsewhere with their husbands before their identities were fully formed. As a result their perceptions of themselves as Mormons was also threatened. However as they became mothers in the early years after the end of the war, many of these young wives sought support and spiritual succor among the Saints. Naturally they took their young children with them when they began to attend meetings in local wards. For this reason, the demographic profiles of most of the new wards in the late 1940s and early 1950s were skewed by huge proportions of very young children. With only a scattering of males above ten years of age and with practically no active members who held rank in the Melchizedek priesthood—for example, at one time the bishop of a ward in the New York stake reported only one active (Melchizedek) priesthood holder—creating a full-scale ward program was sometimes, as they say, an act of faith. Creating such full-scale programs was nonetheless what the Latter-day Saints accomplished time and time again. The first tasks a new bishop had to perform were calling the scattered Saints together, finding a place for them to meet, and establishing a regular schedule of meetings. On the sabbath these included priesthood meeting, Sunday School, and Sacrament Meeting. During the week LDS auxiliary activities included “primary” for the youngsters; Boy Scouts, which, after the war, virtually became an official LDS auxiliary; youth activities (called “mutual” in those days) for any teenagers who might be in the new ward; Women’s Relief Society, plus ward teaching (in which two members of the priesthood were responsible for visiting the Saints in their own homes at least once a month). In addition, the bishop and his counselors were responsible for organizing welfare projects by which the ward could earn enough to underwrite the welfare assistance that the bishop from time to time was called on to dispense to Saints in trouble. The gravity of the situation in those early post-war years was summed up in the response given by Wilford Thomas Webb who, after years of service as counselor in a bishopric and service on a High Council, was called as chairman of the stake’s Genealogy Committee. In accepting his new assignment, he indicated that it might not really be much of a change. He reminded President Harold B. Lee that for fourteen years, he had been “chasing live dead ones.”16 Clearly something needed to be done to remind these scattered Saints of their Mormon heritage and their LDS identity. It seems that I’ve been in a building program ever since I came back into activity in the Church. I appreciate it because I realize if the Church isn’t growing we may become stagnant. But here in this area (Northern California) alone we’ve had so many experiences where building programs have brought people back into activity and given them the opportunity to participate in these programs. … We had one of those building plans where the members had an opportunity to go out and work on it … they don’t work buildings that way anymore. It used to be that they sent a Building Supervisor or Superintendent out from the Church and he went around from one building to another … most of (the work) was donated labor. … Now we contracted out some of the plumbing. We contracted out all the brick work—the block work and everything. But for the most part most of the men and many women would go down evenings and work and we spent Saturdays over there working. It was really quite a thing to go down on Saturday because we had a feed at noon. It was fit for a king. They’d bring food down and spread tables out. The sisters would bring food down. And the brotherhood and companionship that developed out of this was good. Not only did this building program bring adult males back into activity in the LDS Church, it also was the occasion of the physical appearance of Mormonism in the American religious landscape.21 For nearly a century, the Saints had maintained missions throughout the nation, but missions for the most part were established in large homes that were not readily identified as religious structures. Now the Saints were constructing buildings that looked like churches. Naturally, the chapels being built by the Saints were not the only new religious structures changing the religious visage of the nation. But these chapels were all built according to standard plans. From the architectural and aesthetic standpoint, they were not distinctive. But they were distinctively Mormon, so much so that they announced to the world that the Saints had arrived. At the same time, these ward chapels also announced to the scattered Saints that they had “come home.” Their church was fully organized and there waiting for them to participate. And participate they did. With their gymnasiums, chapels, classrooms, kitchens, relief society areas, and bishops’ offices, these buildings functioned as centers of LDS cultural enclaves for many years. Until the consolidated meeting schedule was introduced in 1980, the buildings were in use day and night practically seven days a week. From the perspective of the present, it is possible to see that, with the construction of all these ward chapels, what was happening was nothing less than the creation of “mini-Mormon culture regions” outside the intermountain west. In these new Zions, Saints could recover or be introduced for the first time to what “being Mormon” means. These crucial years between 1945 and 1965, when the Saints literally built LDS worlds for themselves in the midst of the mission field, were years of consolidation and renewal. In a sense they form a discreet era in the history of Mormonism, years in which Mormons prepared themselves for a new effort to carry the gospel to the world. Scattered, spread thin, and with LDS identities in a somewhat precarious state at the beginning of the period, they were ready at its end for the injunction they soon received that “every member should be a missionary.” When the Saints were so instructed by Church President Spencer W. Kimball when he became their beloved prophet, they were once again ready to set their sights on the end of time and, as had their forbears in the days of Joseph Smith and Brigham Young, they embarked on a process of trying to “fellowship” the entire world into Mormonism. Things are changing in Mormonism in the twentieth century. It seems to me that one indication that things are changing is that there is a great longing for the traditional pattern of Mormon identity. Saints do not come back to Provo or St. George to retire merely because of the climate and the scenery, even though it is beautiful. The climate at least today is very nice. Scattering, they turn homeward to Zion to find that feeling of being a saint. The new polygamy I would suggest also can be interpreted at a functional level at least as a search for Mormon identity. Plural marriage sets them apart. It keeps them from being just a miscellaneous Christian. Some weeks ago I had a conversation with a bishop that I knew well from Delaware. I talked to him about what I was doing and what I was learning in this research. I said, “The saints have lost something” in stopping building their own buildings, finishing their own carpets—putting them down the day before the dedication and so forth. He said “It sure is easier now.” And I said “Yes. It sure is easier.” But he said, “The saints still love one another.” And I reminded him that one of the early statements that gentiles said about the Christians was “See how these Christians love one another.” It is quoted in my Methodist Church very often. Methodists love one another too. And Baptists and Presbyterians and so forth. But we have a world in which we have in a sense a Sunday religion. We go to church on Sunday and go away during the week and live in a pluralistic culture. Is this what is happening to Mormons? And if so, what does it mean for Mormon identity? I’m often asked if I’ll ever stop being a Methodist and become a Mormon. A different version of this question ought to be asked at the end of this lecture: Will Mormons stop being Mormons and turn toward a Sunday kind of Christianity? Is that a fair question? The best treatment of this creation of a Mormon ethnic identity is Dean L. May’s section of the Mormons in The Harvard Encyclopedia of American Ethnic Groups (Cambridge, MA: Belnap Press, 1980). Mormonism: The Story of a New Religious Tradition (Urbana: University of Illinois Press, 1985), Chapters 3 and 6. Reed Smoot Diary, passim., 1909, 1910. As quoted in Douglas D. Alder, “The German-Speaking Immigration to Utah, 1850-1950,” Master’s thesis. University of Utah, p. 115. As quoted in Douglas D. Alder, ibid., p. 117. This entire section is adapted from the very fine discussion of the church’s decision to suspend the direction to gather Zion that the Saints had received by revelation. See Alder, Masters thesis, pp. 114-18. In much the same manner as does Roman Catholicism, the LDS Church operates ecclesiastically on the basis of geographical units. When members are spread across a wide area, their ecclesiastical supervision comes through a mission. But when sufficient numbers of Saints are present in areas contiguous enough to make geographical organization practical, stake and ward (parish) boundaries are drawn up and full-fledged ecclesiastical units are established. Stakes in Canada and Mexico had been established in the 1890s for Latter-day Saints who wished to continue practicing plural marriage. Although the Cardston Stake was established as a refuge for polygamists, it turned out that the Canadian government refused to sanction cohabitation of polygamists and their plural wives. (Lethbridge Stake Historical Committee), A History of the Mormon Church in Canada (Lethbridge, Alberta: Lethbridge Herald Co., 1968), Chapter 3. Gridley, Sacramento, Oakland, San Bernardino, Pasadena (including San Fernando and Van Nuys), Long Beach, Pasadena, Inglewood, San Diego. La Farr P. Astle, Oral History, L.D.S. Church Archives, p. 6. The so-called oral histories of the “mission field” bishops found in the church archives are not actually oral histories as that term is currently used. They are, rather, answers to a standard set of open-ended questions. The first of these queries asked the bishop to recount his personal history as a Latter-day Saint. Of the scores of such documents examined, very few—probably less than 10 percent—contained references to a bishop having grown up outside the Mormon culture region. It is interesting to note, however, that few of these post-war “mission field” bishops were closely connected to renowned LDS families in Utah. As a group, these men more often represent those families who had followed their file leaders in the first part of the twentieth century, rather thah prominent families. Doyle N. Hankins, Oral History, p..
Wilford Thomas Webb, Oral interview, p..
Lamar P. Astle, Oral History, p. 10. Rocky Mountain Empire: The Latter-day Saints Today, p.. The number of buildings constructed outside the Mormon culture region between 1945 and 1955 did not surpass the number built in the Mormon culture region, but it almost equaled it. In California and the Pacific Northwest, 101 buildings were constructed. In other areas besides the Mormon culture region, 104 new buildings were constructed.